…a professional artist with 30 years’ experience. 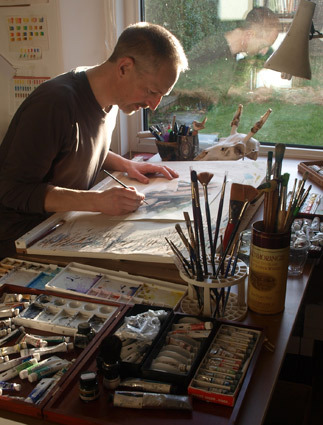 After art school in Wales in the eighties I was given diploma membership of the Society of Artists & Designers – DipSIAD. I hold a BA (Bachelor of Arts degree) with distinction, in Visual Communication. I’ve also studied at Duncan of Jordanstone, Dundee and Edinburgh College of Art. My career as an artist started with an advertising agency in Wales. It wasn’t long before I sought out the bright lights of London, where I spent ten years as an illustrator, designer and fine artist for some of the most prestigious advertising and publishing companies in the country. In the mid nineties I relocated to Scotland to follow my passion for adventure in wild places and to teach hillwalking, climbing and canoeing, also becoming a creative arts facilitator. Continuing my work as a painter I mainly use watercolour, but gouache, acrylic or graphite pencil may be used for specific pieces, and I often work outdoors using charcoal for landscapes. I run courses in drawing and painting – see my blog – and also have artwork in galleries and private collections in both the UK and abroad. I also paint landscapes, seascapes and wildlife. Click here to view my landscapes, seascapes and wildlife work.